Kyrgyzstan is a mountainous country in Central Asia, bordering Kazakhstan, Uzbekistan, Tajikistan, and China. We started our travels in Bishkek and traveled to Karakol with the intention of hiking. Unfortunately, we had to cut our trip short due to health problems. 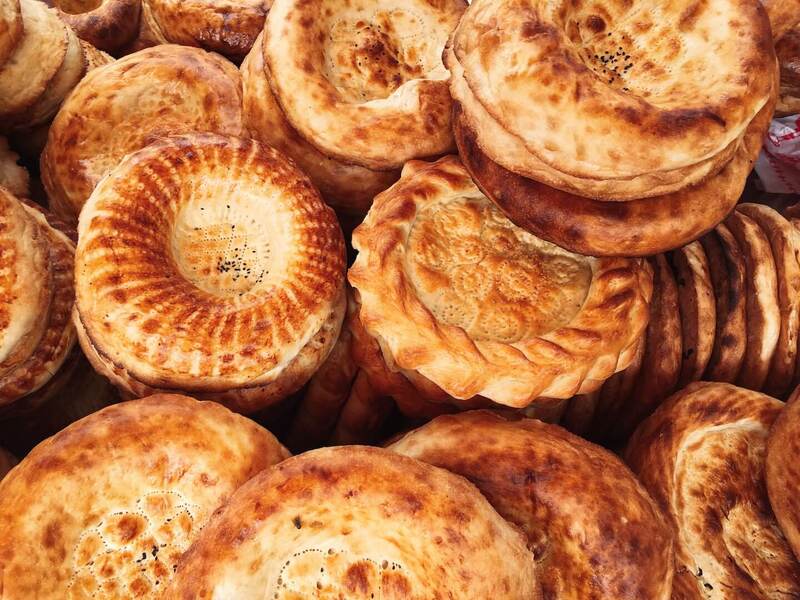 Definitely read our Bishkek City Travel Guide to find out where to stay, where to eat and what to do. We’ll return to this beautiful country someday to finish what we started. Below, you’ll find our future 20-day itinerary, with helpful tips and additional resources, which we assembled while planning our trip. Planning a trip to Kyrgyzstan? Read these helpful guides next! Regions: Kyrgyzstan is divided into seven regions, known as oblasttar (singular: oblast). Language: The official languages are Kyrgyz and Russian. Tipping Etiquette: Tipping isn’t common. In restaurants, a 15% service charge is automatically added to bills. Water Quality: Even though the tap water is chlorinated, it’s not very good quality. You should boil water, or drink bottled water. Something Interesting: 70% of Kyrgyzstan is covered in mountains. As stated in our introduction, we left Kyrgyzstan early for health reasons. This is what we intended to do with our time but only made it to Karakol. 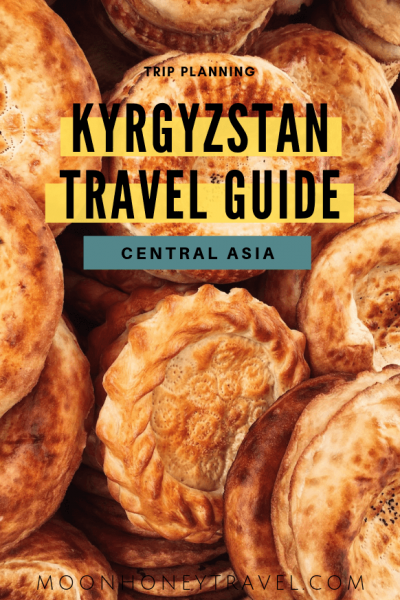 We’ve collected all our notes here so that it might help you plan your trip to Kyrgyzstan. 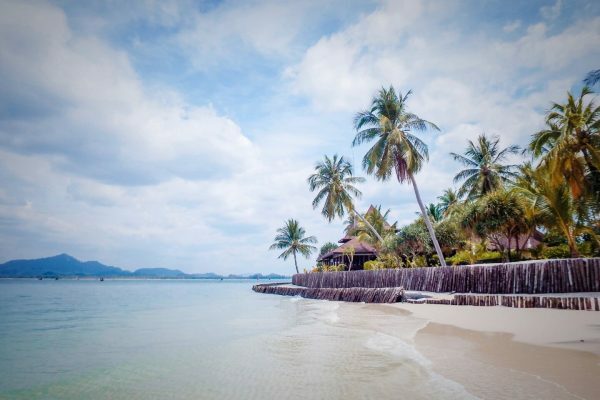 We hope to do this 20-day itinerary someday in the future. Kyrgyzstan’s capital city is easily explored on foot. 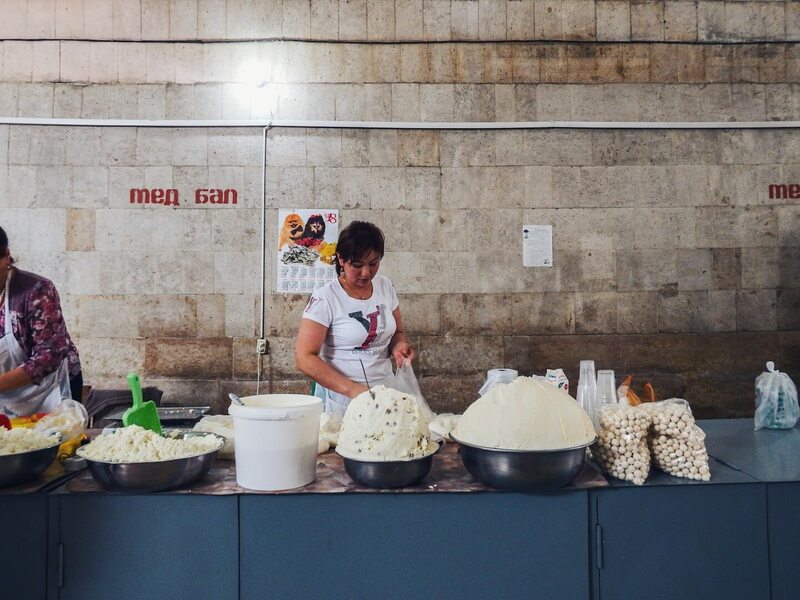 We spent a week hopping around Bishkek, but you only need 2 days to get a good feel for the city. 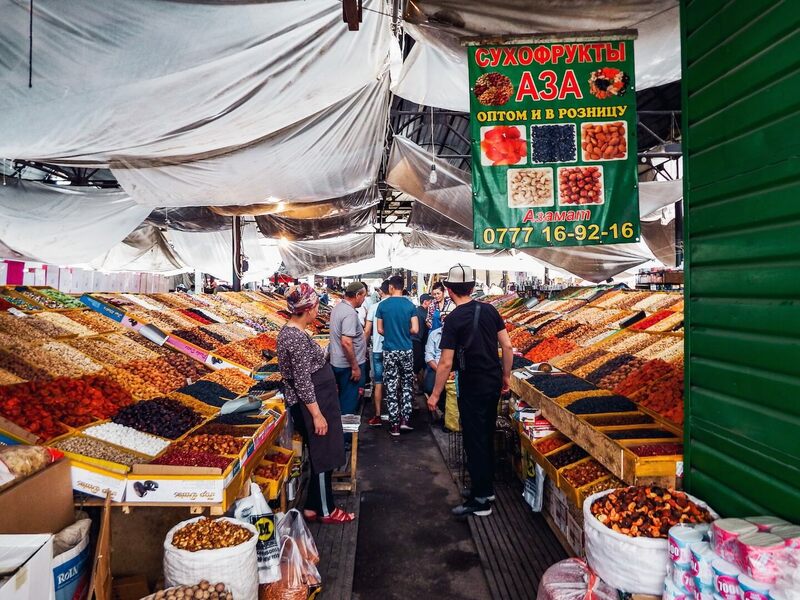 During your visit, you can shop at Osh Bazaar, bathe at the Russian-style public bathhouse Zhirgal Banya, see an opera or ballet at the Kyrgyz National Opera and Ballet Theatre, and sample national Kyrgyz drinks on just about every street corner. Read more about these experiences in our Bishkek Travel Guide. Stay in Viva Hostel – clean, comfortable hostel located 5 minutes away from Osh Bazaar. Ala Archa National Park is located 40 km from Bishkek and makes for a perfect day-trip destination from the capital. You can picnic in the valley, walk along the Ala-Archa River, or hike to the Ak-Sai Glacier. We spent a full day hiking in Ala Archa National Park. Learn how to get to the park and where to hike in our Ala Archa post. The journey to the city of Karakol takes 6-7 hours. Head to the Western Bus Station in Bishkek to catch a Karakol-bound mashrutka (minivan). Don’t worry about finding the right van. The drivers will direct you to where you need to go. The vans leave when they fill up, so depending on when you arrive, you could depart in five minutes or in an hour. The ride costs 400 som per person. The van drops you off at the Karakol Main Bazaar. From there, you can grab a taxi, or walk to your accommodation. Stay in Riverside Guesthouse. This might be the best guesthouse we’ve ever stayed in. The guesthouse is run by a Kyrgyz and Dutch couple who go out of their way to help you organize your trip and answer your questions. They also serve a delicious breakfast. 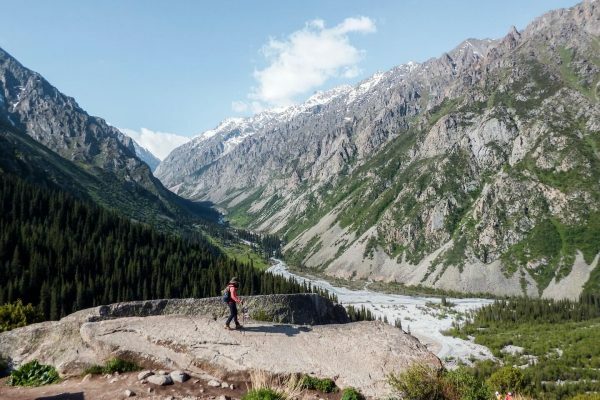 Use Karakol as a base to explore the many hiking options in the area. Most of the hikes are multi-day treks and require camping equipment. You can rent gear in Karakol. Depending on your expertise, you may need to hire a guide for some of these treks. Archa Tor Pass Trek (3 Days). This hike starts up the road from the town Kyzl-Suu, traverses the Archa Tor Pass and ends in Jeti-Ögüz. Ala-Kul Lake to Altyn-Arashan (3-5 Days). 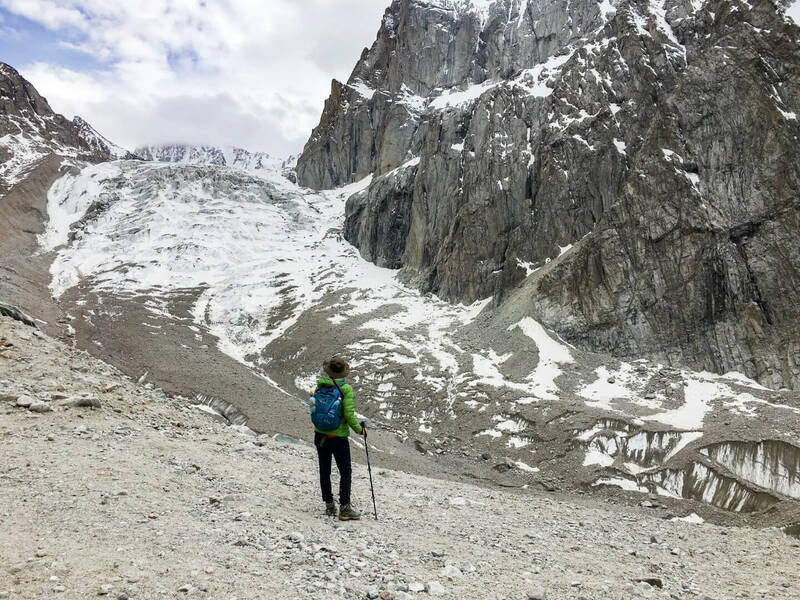 This beautiful hike takes you to the gorgeous Ala-Kul Lake, over a high mountain pass and to Altyn-Arashan, where you can soak in hot springs. As long as there isn’t too much snow on the pass, you can hike this independently. Ontor Pass (3 Days). Off-the-beaten-track trail for advanced trekkers. Skazka, aka Fairy Tale Canyon, is located near the southern shore of Issyk Kul Lake. From what we gathered, you can get on a Balykchy, or Bokonbaevo-bound mashrutka and get off early, at the turnoff to the canyon, N 42.1745694, E 77.3526889. After exploring the canyon for 1-2 hours, head back to the road and hitch a ride to Balykchy, or if you’re lucky Kochkor. In Kyrgyzstan, it’s expected to pay for rides even when you’re hitchhiking. So, make sure to agree to the price of the ride, before getting in. If you can’t get a direct ride to Kochkor, you’ll need to get to Balykchy, where you can grab a mini-van to Kochkor. If this sounds like too much of a hassle, take a mini-van from Karakol to Balykchy and another one to Kochkor. There’s no direct Karakol-Kochkor transit line from our understanding (but please double check). Köl Ükök is a mountain lake, located about 17 km from Kochkor. From Köl Ükök, it’s possible to hike to another glacial lake called Köl- Tör. We didn’t plan this out in detail. We were hoping to do a combination of horse trekking and hiking here. We also wanted to overnight in Yurts. Reach out to Köl Ükök in CBT (Community Based Tourism) Kochkor to help plan your trip. The next segment of the trip should be organized ahead of time through CBT, or another tourist agency. You’ll need to hire a driver (4WD only) to take you from Naryn to Tash Rabat to Köl-Suu (also spelled Kel-Su, Kel Tetiri) Lake and back to Naryn. Whoever you work with will need to organize a border-zone permit (1,000 som) for you so that you can venture to this region close to the Chinese border. Option (1) Hire a guide and horses and take a horse trek to the lake. Option (2) Hike to the Lake. 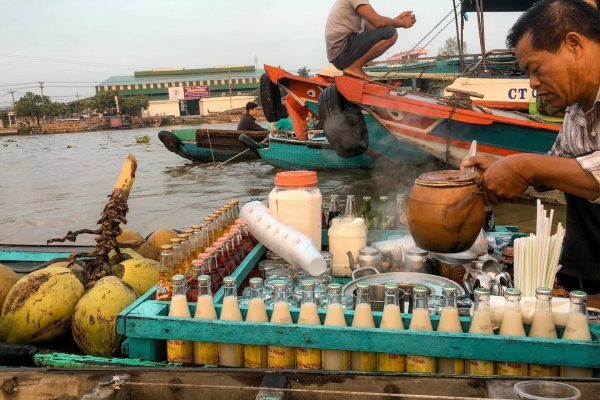 There’s an option to take a boat ride, but you’ll need to organize that in advance. Stay in Bishkek at Viva Hostel – clean, comfortable hostel located 5 minutes away from Osh Bazaar.